EFFE VETERINARIA was founded in 1997. Since then it managed by the owners and staff with professionalism and passion. Great attention is always paid to the needs of our little friends. We are available for all types of consultations. The company handles distribution of the major brands of medicines, veterinary products and pet supplies. Ensuring a vast assortment and easy availability of products possibly not in stock. We carry out wholesale sales to specialty stores, pharmacies, veterinarians, livestock, farms, with possibility of delivery in 24/48 hours in Umbria, Tuscany and Lazio. 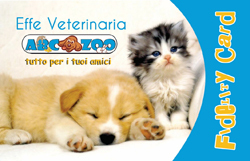 The natural evolution of Effe Veterinaria was the creation of ABC Zoo retail stores, born of passion for all animals and for all their needs, from A to Z.